Aptech’s professional course prepares you for the most glamorous profession in the aviation industry. 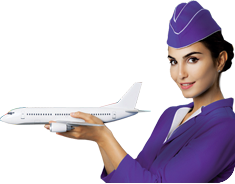 Become a trained cabin crew professional with domestic & international airlines. The number of air passengers in India is expected to be 450 million by 2020**. All these air passengers require the assistance of trained cabin crew professionals for right guidance and a safe journey. Keeping this demand in mind, Aptech provides you complete, in-depth training in all aspects of flying & cabin crew responsibilities. Disclaimer: Course available in select centres only.